The show encapsulates the struggles of Nikhil, a young man who is forced to live with his in-laws for a few weeks. Nikhil’s bittersweet interactions with his wife's family, peppered with the stark differences in their lifestyles, will remind you of your own family and leave you with a smile on your face. "What The Folks" is a journey of how modern families are breaking stereotypes, overcoming generation gaps, and growing to love one another, despite having starkly different world views. What the folks is a cute story about a family. The show encapsulates the struggles of Nikhil, a young man who is forced to live with his in-laws for a few weeks. Nikhil's bittersweet interactions with his wife's family, peppered with the stark differences in their lifestyles, will remind you of your own family and leave you with a smile on your face. 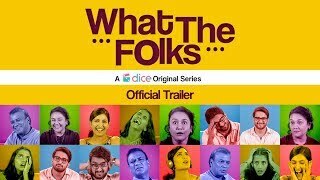 'What The Folks' is a journey of how modern families are breaking stereotypes, overcoming generation gaps, and growing to love one another, despite having starkly different world views.